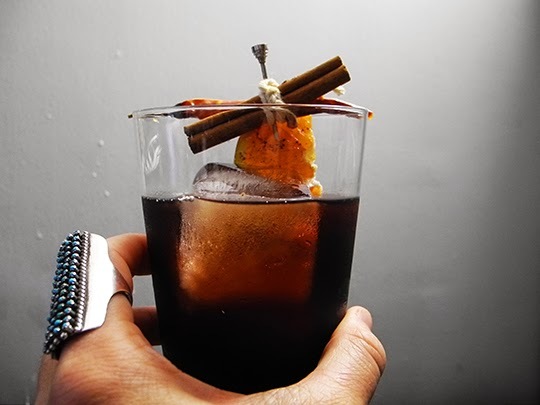 Dearest readers, Negroni Week is almost upon us (June 2-8), a celebration of the Negroni when bars nation wide are serve their best Negroni and give $1 per drink to a charity of their choice. Visit the Negroni Week website to find your favorite local haunt, so go have a Negroni and give back! There are many instances on this website where I have proclaimed my love for the Negroni. I love a classic 1:1:1 variation, the Artichoke Negroni, a Blood Orange Negroni, Negronis made with Mango Curry and Coconut Foam. 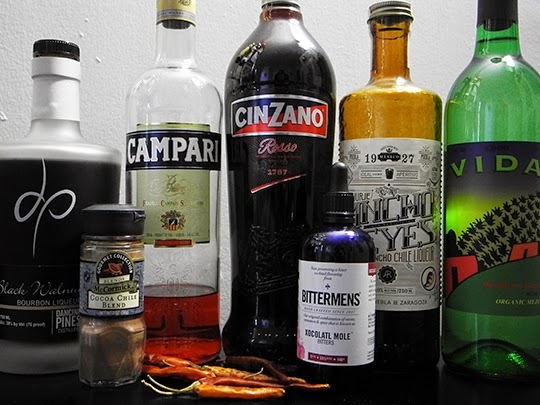 The magic of the Negroni lies in its potential for modifications. The rules (in my mind) are simple; one part strong (gin), one part bitter (campari), one part sweet (vermouth), garnished with citrus - a canonical structure to build upon! The Molegroni is inspired by one of my favorite dishes on the planet, mole. Dark, bitter, savory, its a a highly complex sauce made from nuts, bread, chiles, fruit, cinnamon, spices, and chocolate, and is typically made from over 20 ingredients! The first version of this cocktail I made was with a dark chocolate liqueur as the "strong", which failed miserably as the chocolate flavor was too dominant, way too sweet, and deemed an epic fail. After a few more trials, I tried Black Walnut Bourbon Liqueur made by Dancing Pines Distillery in Colorado. 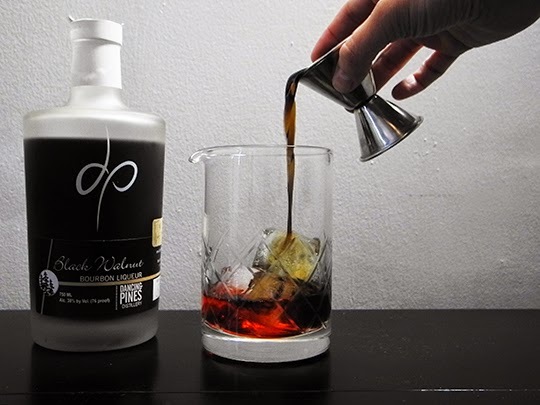 This Bourbon Liqueur is made with Black Walnuts and their Bourbon, which gives the spirit a nutty, bitter flavor that is reminiscent of a high quality dark chocolate. Success! The Black Walnut Liqueur works marvelously with the Campari and the sweet vermouth, and gives the cocktail the baritone bitter, almost chocolate flavors I was looking for. To enhance the mole-ness of the cocktail I've added a touch of Ancho Reyes Ancho Chile Liqueur and a touch of Vida Del Maguey Mezcal. I wanted bold savory flavors and a layer of the smoky, grassy, roasted vegetal flavors from the roasted agave. 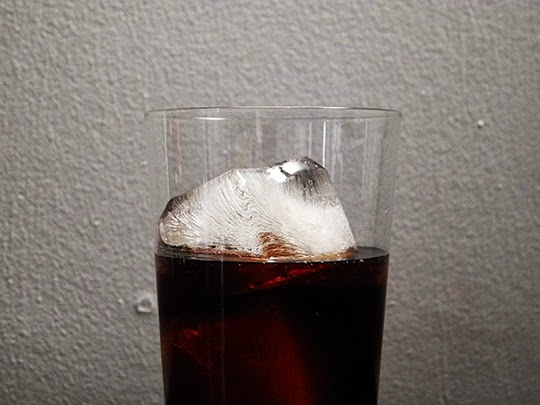 Can we just talk about how gorgeous this ice is for a second? 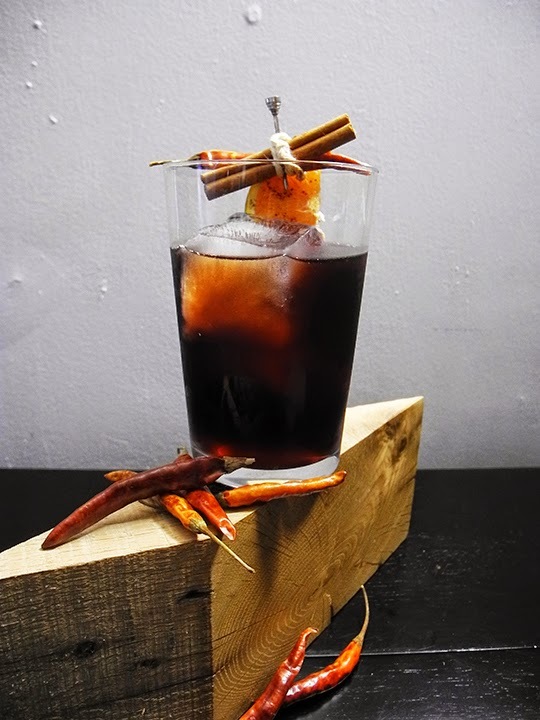 The result is a cocktail that is extremely complex, savory, and full of flavor. 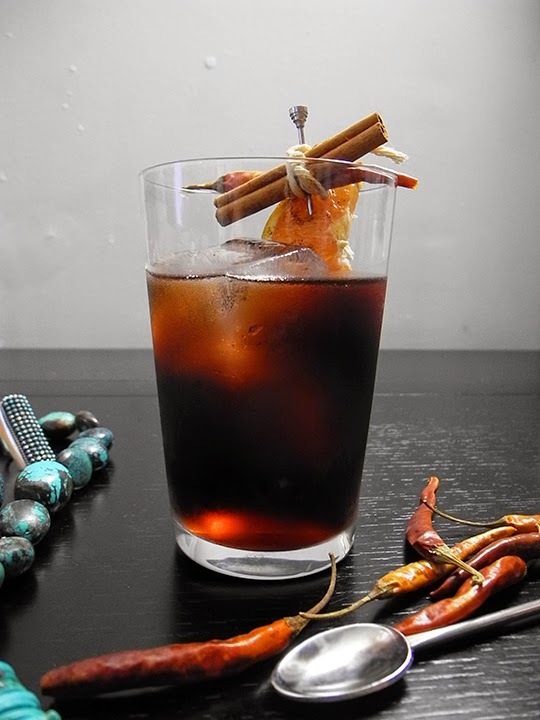 Built on the bitter backbone of the Campari, it has the 5 major flavors found in a traditional mole: chile, sour, sweet, spice, and the "thickener" from the walnuts. I'm pretty impressed how the bitterness of the Campari and the Black Walnut Bourbon work together, and yet do not over power the cocktail. 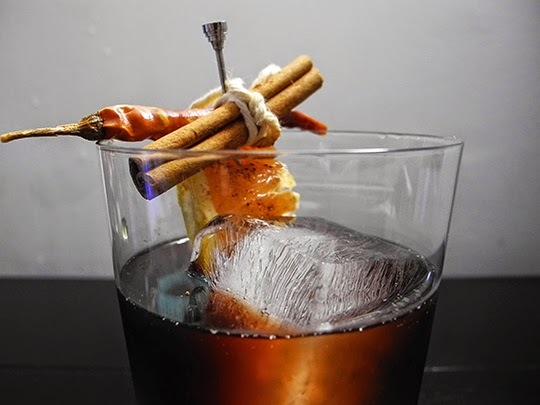 Because of the savory nature of both the Campari and the walnut, the flavors balance nicely with the cinnamon, cocoa, the bright sour flavors from the vermouth, and the subtle kick from the chile liqueur. 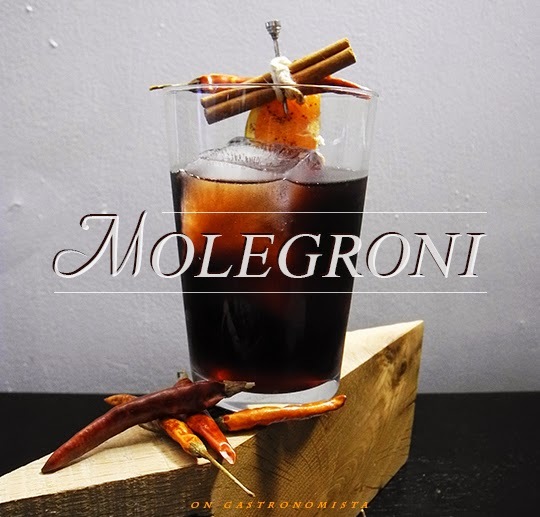 The Molegroni has been an instant hit in Gastronomista HQ, and I hope you like it too. 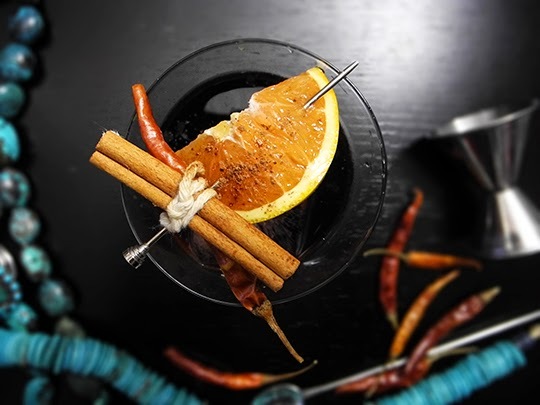 Garnish: Cinnamon Stick, Dried Chile Pepper, Orange Slice with a dash of McCormick Cocoa Chile Blend. I can't help but to get in on the action myself - so if you like the Molegroni - please support my charity of choice, Habitat for Humanity. I've volunteered for Habitat for Humanity many times over my life, and have always found it to be an enriching experience and a great way to give back to the community. Donate here, or pick up a hammer or a nail gun and get in on the fun.